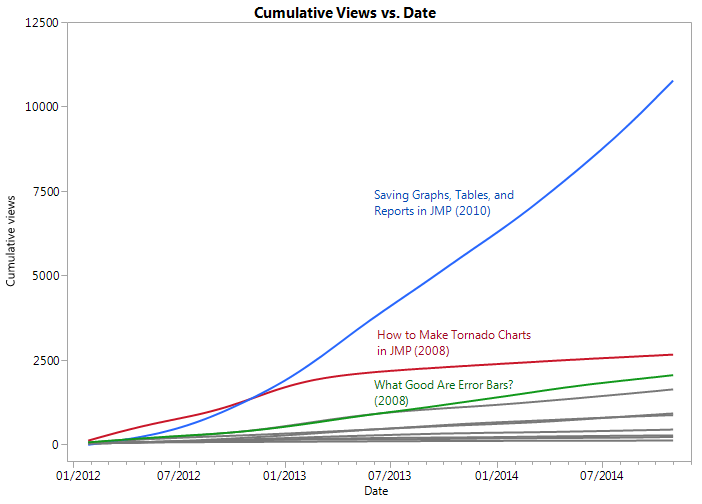 As I approach the one-year anniversary of my first post for this blog, I’ve grown interested in how the popular JMP Blog posts from the past have done in the years that follow. In other words, do the popular posts continue to be popular? A good starting point for an initial investigation is the top 10 JMP blogs from 2011. I looked at the time period right after that list was published to just a few weeks ago: from Jan. 26, 2012, to Oct.31, 2014. The data available to me comes from Google Analytics. If you pay attention to the view counts, you might notice the discrepancy between the Google Analytics views and the total views shown on the blog entries themselves – that topic is beyond the scope of this post (it appears to be a common problem when comparing the reports of different web analytics tools, and there are many possible reasons for it). If you prefer to see this visually, below is a slopegraph created in Graph Builder comparing the 2011 rankings to the 2014 view count since the original list was published. The drop in rank of some posts isn't so surprising. It may be that Mario Kart Wii isn't as popular a game as it has been. And it makes sense that a blog post about a book giveaway (How to Make Practical Sense of Data and Win a Book) holds much less interest now that the contest has long ended. Why do you think particular posts rose or fell in the ranks? The change in ranking tells only part of the story. Fortunately, I also have the weekly view counts available to me. Below is the cumulative view count of each of the blog entries over time. I've highlighted the top three in a different color and labeled them. It was interesting to me to see that it's the technical posts and, particularly, the “how to” articles that seem to stand the test of time quite well. The "Saving Graphs, Tables, and Reports in JMP" is the most noteworthy to me, as even in 2014 it remains among the most popular posts for the year. A natural next question is: What were the most-viewed blog posts during that time frame, ignoring the original list? Are any of your favorite JMP Blog posts missing from this list? Leave me a comment below and let me know your favorites. Thanks for reading!